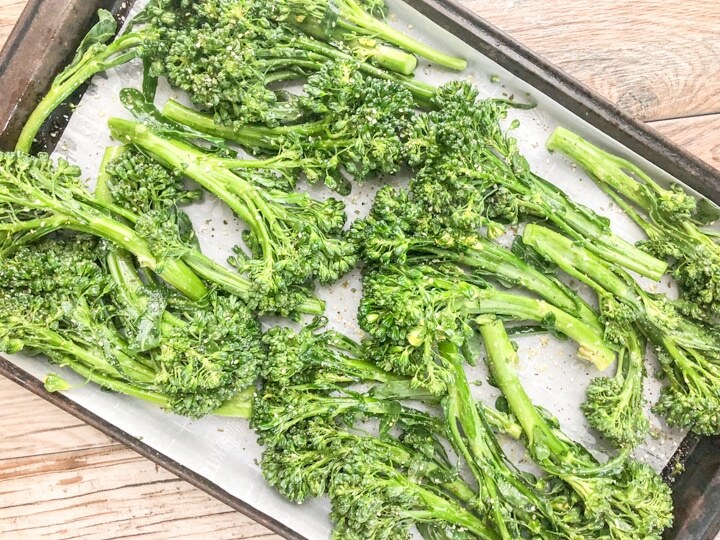 This Oven Roasted Broccolette Recipe is a super simple recipe that’s perfectly roasted in as little as 8 and 10 minutes. This no-fuss side dish is made with 4 basic ingredients that are most likely in your pantry as we speak. If you do not have the same ingredients on hand – do not fret. As long as you have extra virgin olive oil or avocado oil and kosher salt you’re good to go as this recipe is easily adaptable to meet your needs and taste buds. Remember, my goal when posting recipes is to provide you with recipes that you can easily transform based on the ingredients you already have on hand. Sure, some recipes may require that you have some of the same key ingredients in order to capture the true essence of the dish, but more often than not you can use seasoning and spices you currently have to capture that same great taste. So come along and join me on this quick ride as I walk you through the steps for delicious Oven Roasted Broccolette. Please see the recipe card below for more detailed instructions regarding oven temperature and the seasoning I used. While roasting, broccolette will turn a vibrant green color. Allow tips of florets to become slightly charred. First, broccolette and broccolini are the same. In other words, the two can be used interchangeably and is a hybrid vegetable, a cross between broccoli and Chinese broccoli. Did you know that broccolette and broccoli are closely related to the cabbage family and are both cruciferous vegetables? Although this fun fact is true. The two things that really set the broccolette and broccoli apart are their physical appearance and taste. Broccolette has a tall slender stalk with short florets and small leaves which are also edible. They are tender and more delicate whereas broccoli has a short stalk and a large flowering head and are heartier. As far as taste, broccolette are mild and sweet compared to broccoli which has a slight bitter taste. 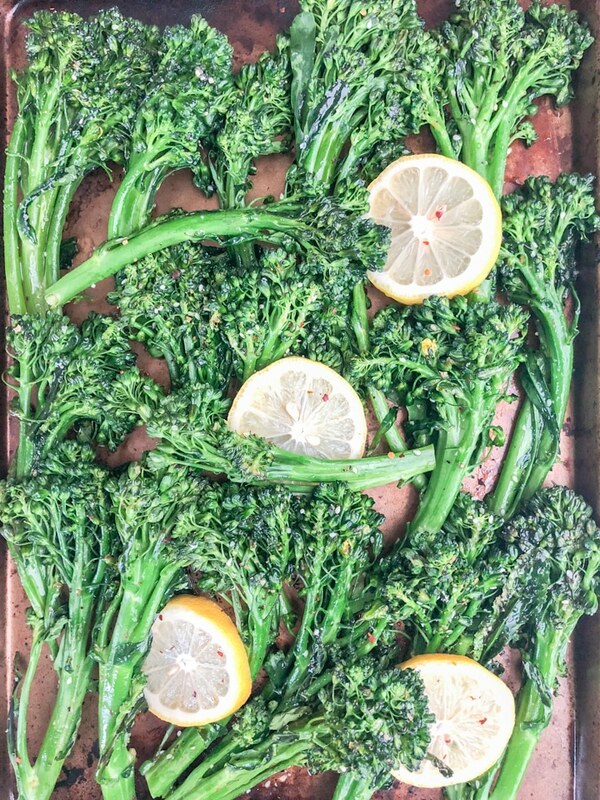 Broccolette and broccoli are great when sauteed, added to a stir fry and of course oven roasted as in this Oven Roasted Broccolette Recipe; however, when it comes to steaming these vegetables, broccoli holds up well compared to broccolette. I’d love to read your comments in the comment section below. By the way, if you love Pinterest or Instagram, I’d love for you to follow me. 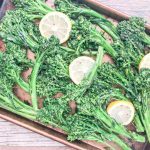 Oven Roasted Broccolette Recipe (also known as broccolini) - This a super simple side dish that's made in under 10 minutes and requires at the very least 4 basic ingredients to make it extra delicious. You can get a boat load of nutrients in this one pan recipe. Preheat oven to 415 degrees. Prepare a sheet pan with parchment paper. Cut lemon into wedges. Set aside. Wash broccolette and pat dry with paper towel. Trim ends of stems (about an inch) and discard. Drizzle liberally with extra virgin olive oil and toss making sure all crevices are coated. Season with kosher salt and garlic and herb blend. Roast for 8 to 10 minutes or until florets tips are slightly browned. Before roasting broccolette, trim ends of stems (about an inch) and discard.